Five months ago today, the news from Newtown, Conn., stunned the world. Twenty children and six teachers and administrators had been killed at the Sandy Hook Elementary School. Rob Sibley (right) responds to receiving the devotionals on behalf of his fellow Newtown first responders, Bob Virgalla (next to Sibley) and Ken Carlson (center). Looking on are John Christensen (left) and Royston Bailey. The anguish of the morning of Dec. 14, 2012, is profoundly real for the families of the innocents who died and those who rushed to try to rescue and save them. Those who rushed in included three members of the Newtown United Methodist Church – Rob Sibley, Ken Carlson and Bob Virgalla. 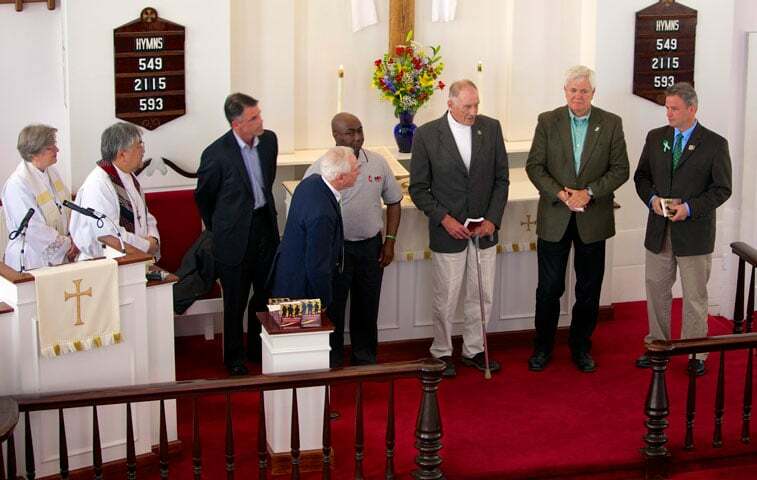 In recognition of their service on Dec. 14, the three received the first printed copies of “Strength for Service to God and Community” during worship April 28. The Commission on United Methodist Men recently published the new book of devotions for first responders.